There are many different housing options for international students studying at Georgian College. There are three main options for you to choose between: Homestay, residence and off-campus housing. Students are carefully matched to one of our caring host families who will provide a private bedroom, food for three meals per day and internet access. It’s a great way for you to immerse yourself in Canadian culture and experience Canadian life in a family setting. It offers lots of opportunity to practice your English and improve your language skills. Georgian College partners with Canada Homestay Network Inc. to provide students with the best experience possible. The placement fee is $200. After submitting your Homestay application, you will be sent an invoice within 48 hours. This must be paid in full before you receive information about your host family. Fees are subject to change and additional fees may apply. * Each option requires a minimum of three months in the Homestay you are placed in and the three months must be paid in advance. There are many options for finding housing off-campus. We recommend places4students.com. View photos of each residence and speak with your landlord (and roommates where possible) on the phone to ask questions before you commit. You can also view local classified ads and even browse Facebook to look for rooms for rent. The cost of private rentals is generally between $650 and $800 per room per month (meals not included) in Barrie, or $550 to $650 per room per month in other campus communities. In addition, students must pay $100 to $150 for utilities. Note: these listings are external to Georgian College and as such have not been verified. Georgian College is not responsible for the accuracy of the information listed or for any liability of any kind relating to or arising out of the information or any use of the information. Each user of these listings is responsible for verifying the accuracy of any information he/she may obtain from these listings and for any risk of injury or loss of any kind relating to or arising out of his/her use of the information. Use of these listings constitutes acceptance of any risk of injury or loss of any kind relating to or arising out of the information in these listings and a release of Georgian College and its employees, agents, contractors and representatives, from liability of any kind relating to or arising out of the use of the information in these listings. We advise students to finalize or research their accommodations BEFORE they arrive in Canada. Some hotels offer discounted rates to Georgian students. Please email us to inquire. All rates are per room and not per person. You can save costs by sharing the hotel room with another person. It is up to you to find a person to share with, or you can rent a room on your own. Please inquire about the rates for multiple people when you contact us. International student enrolment at Georgian College has more than doubled over the last five years, and is continuing to increase each semester. Having students enrolled at Georgian College from more than 60 countries provides great opportunities. We are always looking for new families to host international students at our campuses (Barrie, Orillia, Midland, Muskoka, Orangeville, Owen Sound and South Georgian Bay). As a Homestay host, you would be fairly compensated for your services, as well as receive the additional benefit of a cross-cultural experience. We work with Canada Homestay Network to deliver the Homestay program. 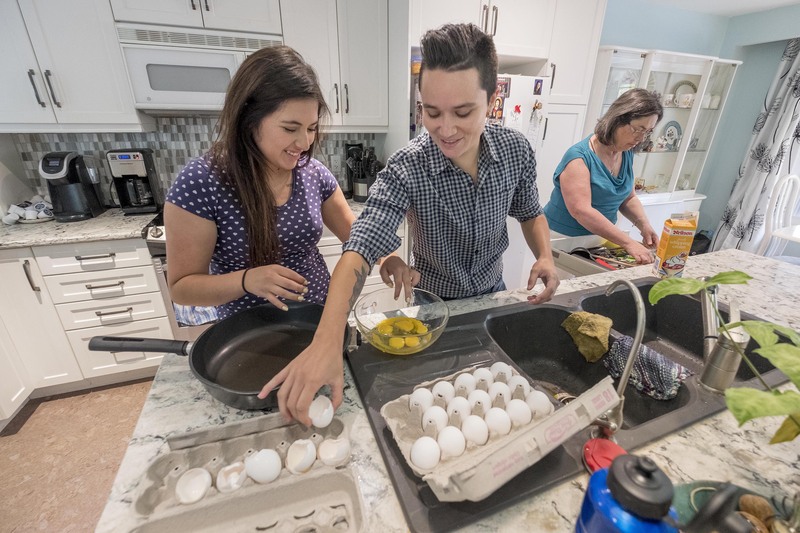 Learn more about what you need to provide as a host, and the benefits of the Homestay program for both you and your student. Complete and submit an application form through our third party Homestay provider Canada Homestay Network. You will be contacted for a house visit once your application is received and reviewed. A Canada Homestay Network representative will visit the home, look at the room the student will be staying in and conduct an interview. If you are approved, you will be asked to submit a vulnerable sector/criminal record check and two references. If you have any further questions about becoming a host, please email Canada Homestay Network.